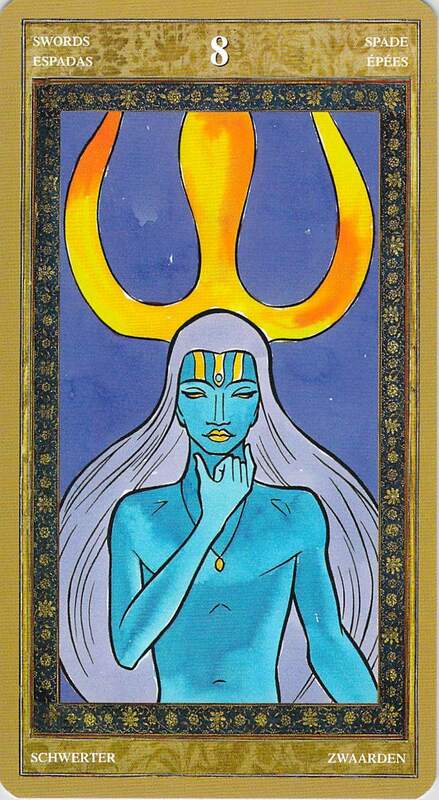 Cards for the Day: The Emperor/r’d 8 of Swords: What does it mean to be a true warrior? 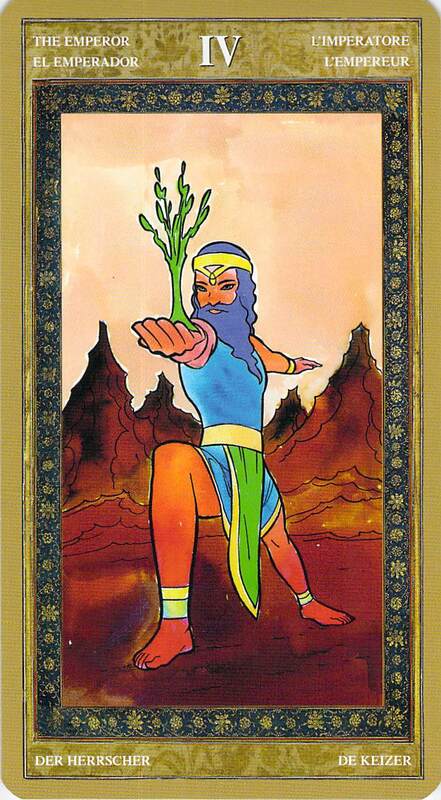 I love the Emperor’s Warrior II pose in the Yoga Tarot. You can almost imagine the Emperor turning his hand over and beckoning with his fingers to an opponent. Saying, come on, bring it on, I’m ready for battle. Of course, he isn’t really ready. None of us are. Inside, he’s the reversed Eight of Swords (which more traditionally is depicted as a bound and blindfolded woman inside a cage of swords). His confidence that he will win this battle may not be high. He is beset by self-doubt. When in this kind of doubt, though, and when we have a major crisis of self-confidence, we can turn to structure to put things back together and to give us the tools we need to get through the day. We can take the attitude that ready or not, we’re going into battle. Ready or not, we can bow, look our opponent (or our problems) squarely in the face with a calm gaze, take a ready stance, and charge in with full commitment to our goals. Ready or not, we can do this. When a warrior who is clearly not ready, who is clearly heading into battle injured or tired or sick or full of internal strife, does this, that is what gives me shivers down my spine. Because that’s true commitment, and it’s true courage. What do I mean by turning to structure to keep us together? Let me explain by way of an analogy. I used to practice martial arts, and in the martial arts, one of the most terrifying spirit challenges you can take on is breaking a board. In my opinion, at a time like this, absolute formal etiquette (structure) can be the tool that keeps us calm enough to face the challenge. Taking time for a short meditation, bowing to the board holders, bowing to teachers, bowing to any onlookers, bowing after the break — these are structures that keep us in the moment, keep us calm, and keep us moving forward toward our goals. Formal etiquette can be a tool that creates absolute, icy, formidable, unstoppable calm. Forget the idea that martial etiquette or any other form of etiquette is something you do for the sake of respecting diverse cultures — it isn’t. Etiquette has a far more important purpose. It is a highly developed technology for producing a calm, focused mind. Though we may not need to break a board today, we can still turn to structure as a way to take control of a situation that we fear might spiral out of control. We can use organizational tools such as calendars and schedules to create structure in our day. We can use tools of business etiquette to take charge of or help us face a problem that can’t be solved right away. Polite communication combined with absolute sharp swordsmanlike honesty can go a long way when it comes to addressing problems that you can see brewing, such as problems that you worry may displease your business partners. Try addressing these problems head on. A word of caution, though — let matters of diplomacy in business be handled by your beautiful etiquette, not by deceit. For this warrior-like strategy to work, you have to be completely honest. Don’t try to whitewash unpleasant truths. Don’t encourage denial of difficult realities either by yourself or by those you work with. Cut through deception (even self-deception) with your sword of truth. Accept whatever consequences may result from your actions, but also realize that others will respect you, and you will respect yourself, for your direct approach. If we have to, we can live with broken feet. We can’t live with a broken spirit. Take charge today, and let your calm exterior actions be the rope that pulls your interior self out of its doubt, anxiety, and fear.